This article is about the item that appears in Super Mario 3D World and Captain Toad: Treasure Tracker. For the item that appears in Super Mario Bros. 2 and its remakes, see Cherry. For the Bros. Item in Mario & Luigi: Partners in Time that has similar effects, see Copy Flower. For the sticker in Paper Mario: Sticker Star that allows Mario to use clones to defeat enemies, see Clone Jump. Two cherries with eyes connected by two blue stems and a leaf. Creates a double of the player. 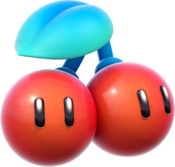 The Double Cherry is an item first appearing in Super Mario 3D World. These cherries are found floating just above the ground or inside ? Blocks or crates. When characters grab this item, a clone of themselves appears. The clones keep the original characters' state (for example, Fire Mario gets a clone that also has a Fire Flower), power-ups affect all of them, and they all move identically. The clones can be used to activate certain switches and platforms. There can be up to five clones at one time. If players hit question blocks which contain Double Cherries when five doubles exist, a Coin will come out instead. The clones disintegrate if harmed, and they all disappear when the player grabs the Goal Pole, awarding 1000 points per clone. The players can also Ground Pound on other players to steal their double power. Double Cherries also appear in Captain Toad: Treasure Tracker, acting just like they did in Super Mario 3D World. The Double Cherry is actually the result of a mistake made by a staff member with the placement tool, which created two player Marios. The staff thought it was a good idea, and decided to put it in the game. The Double Cherry is the only power-up in Super Mario 3D World where the character who picks it up actually speaks, rather than making a noise, as in the case of Cat Mario. In Mario Kart 8 and Mario Kart 8 Deluxe, a Double Cherry can be seen on the redesigned Tropical Grocery logos. This page was last edited on February 15, 2019, at 16:41.